Cover image © Aurum Press. Having moved to one of London’s Olympic boroughs during the 2012 Olympics, it has been hard to escape London 2012 fever. Indeed, it has even affected me and I am now the proud owner of a road bike in my vain attempt to be like Bradley Wiggins. 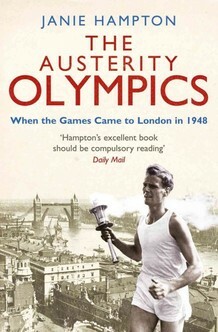 With the infection still coursing through my veins, I stumbled upon Janie Hampton’s The Austerity Olympics: When the Games Came to London in 1948 whilst wandering through a Waterstones in Cardiff. The most heart-warming thing about this book is in its tales of a much simpler time. A time where amongst the bomb damage of the WWII, young boys would sit looking wistful outside a stadium in the hope that someone would get them in. A time when the athletes had to bring their own towels and British men’s team got a pair of complimentary underpants. Despite this the press then were just as cynical and prone to a spot of doom-mongering before the event started as their modern counterparts! From the annals of Olympic history, Janie Hampton brings to life a world getting back on its feet and rejecting the fascist fervour and the failed Aryan idealism of the previous games in Berlin, 1936. This was a time where amateurism meant just that (in most cases) and consequently the world trained its eyes on athletic ‘housewives’ such as The Netherlands’ Fanny Blankers-Koen – although only 10% of the athletes competing in 1948 were women. A good deal of the book is given over to the behind the scenes action as well as the action on the track and field, in the pool, ring or velodrome. We hear about the athletes' rations of a cheese sandwich, apple and a boiled egg, amusingly accompanied by a photo of two female athletes, one Argentinean, one Austrian, inspecting their lunch with bemused expressions. It is perhaps not surprising then to read that different nations brought extra food with them. Also interesting is the politicking that went on behind the scenes. The world after WWII looked a lot different and some nations were notable in their absence. Germany was one of these nations, along with Japan, who were diplomatically not included. There is a poignant reminder that many athletes who competed in 1936 were no not longer around to compete in 1948, some having died in Nazi concentration camps. Add to this that Israel didn’t get an invite, as they didn’t yet have an Olympic committee, and Ireland kept falling out over the insistence of the Organising Committee of referring to them as Éire. Overall, prhaps the best thing about Austerity Olympics is that it manages to piece together a very complex tapestry of divergent individuals’ narratives, and a mountain of factual information, and make it genuinely engaging at the same time. Switching between microscopic focus and looking at the bigger picture means that the tales are never boring. A great read for the post-Olympic hangover.